Divide players into two teams. 3-5 players per team. A team gets 14 shots per round (two stages). Each player takes turns firing shots within 20 seconds. In the first round, a team decide whether to attack or defend. The goal of an attacking team is more difficult, but the reward is higher. Whereas a defensive team could reach their goal easier. A round consists of 2 stages. 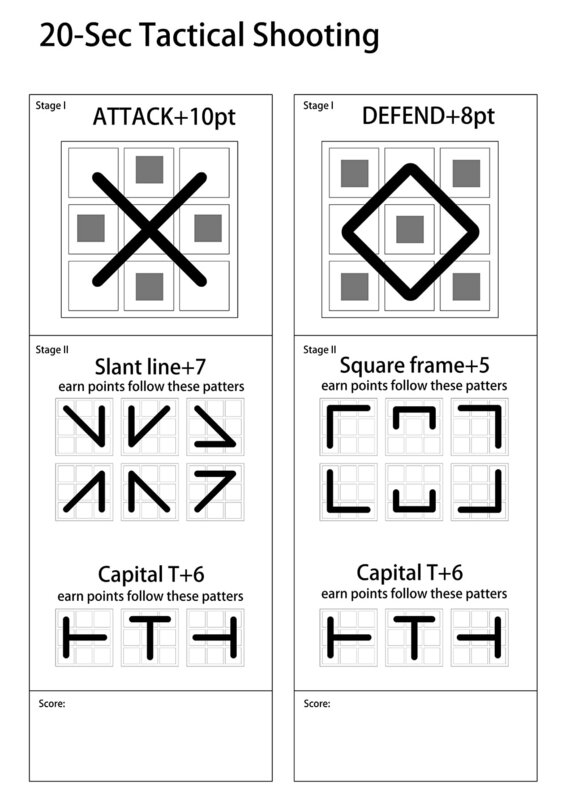 For stage I, a team can score by creating a pattern in accordance with the team's goal. (An X for attacking team; A diamond for defensive team.) If a team missed the goal, they can enter stage II to make up for the score by creating patterns in accordance with the team's goal in stage II. If players have two sets of 3x3 grid target board, two teams can play simultaneously. If not, two teams should take turns per round. A game lasts three rounds. Keep score at the end of each round.